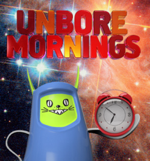 Having already unbored grandparents and relationships, this latest iteration, "Unbore Mornings," is an iPhone app that promises to unbore you at the crack of dawn. (Are you really even bored then, or just surly?) The app scans news headlines, Hollywood gossip rags and your Facebook to produce a ready-to-consume news source that hits you at dawn's first beaming crack. In keeping with the tyranny of random interwebs humour, headlines are read to you by a cat that speaks 20 languages. The whole thing wraps up nicely with the eager tagline, "BE A FESTIS!" This work of gleaming promise was brought to you by Akestam Holst, Stockholm.